I wouldn’t claim to be especially plugged in to the food scene in Norwich, but even I picked up the buzz that went around the city when the Ivy Norwich opened. 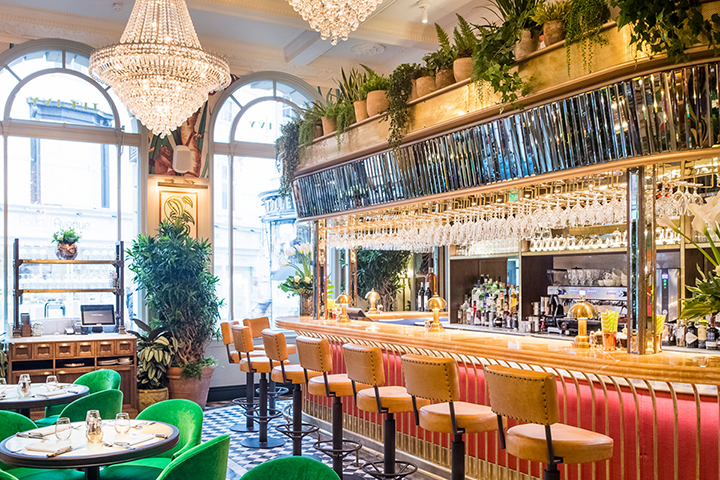 A new restaurant from the Ivy Collection with lush interiors and 147 covers with all-day menus with contemporary British food. Investigation was required. A table was duly booked. There’s no doubt that the interiors are impressive. Designed by the Martin Brudnizki Design Studio, whose portfolio includes the iconic Annabel’s Nightclub, there’s a minute attention to detail, and amazing lively visuals that are designed (successfully) to become an integral part of the experience of eating there. Add to that the effusively enthusiastic and professional staff, and you get an immediate dopamine hit of positive first impression. That just raises expectations for the food, of course. That shouldn’t be a problem. The head chef is Sean Burbridge, who learnt his trade at the 3-Michelin-starred Gordon Ramsay Restaurant, and was head chef for a while at Petrus. The menu for the Ivy restaurants is more classic, less-complicated dishes than the Michelin crowd, but you know that they’re going to be well-executed with some innovative twists. At least, that’s the hope. The starters certainly delivered on the promise. 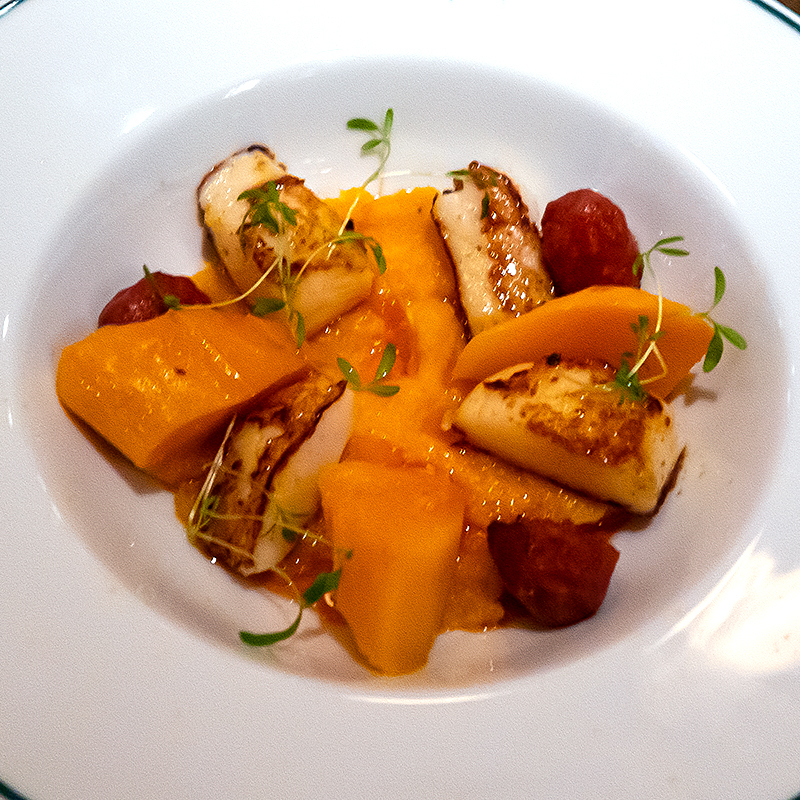 I had roasted scallops with grilled chorizo and ras-el-hanout roasted butternut squash. 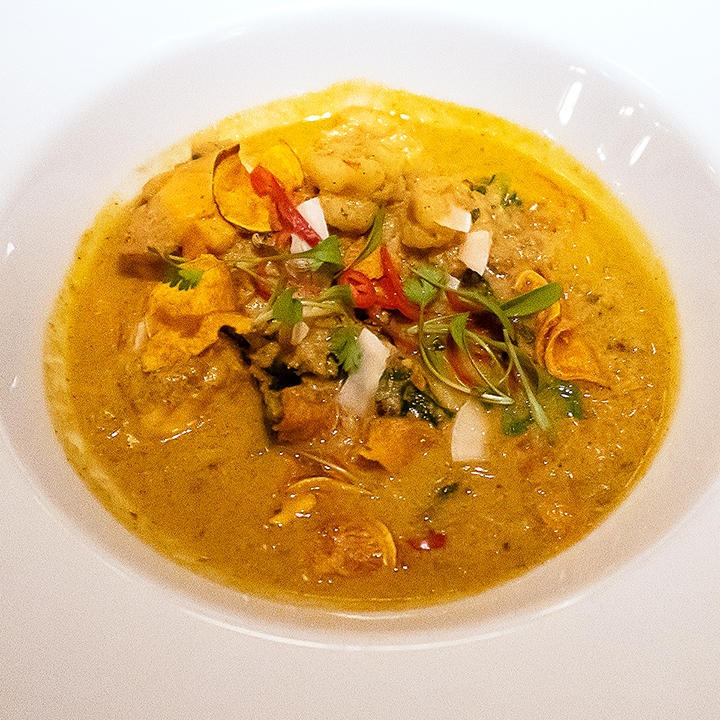 The spice went extremely well with the combination of perfectly-cooked scallops and roasted squash. 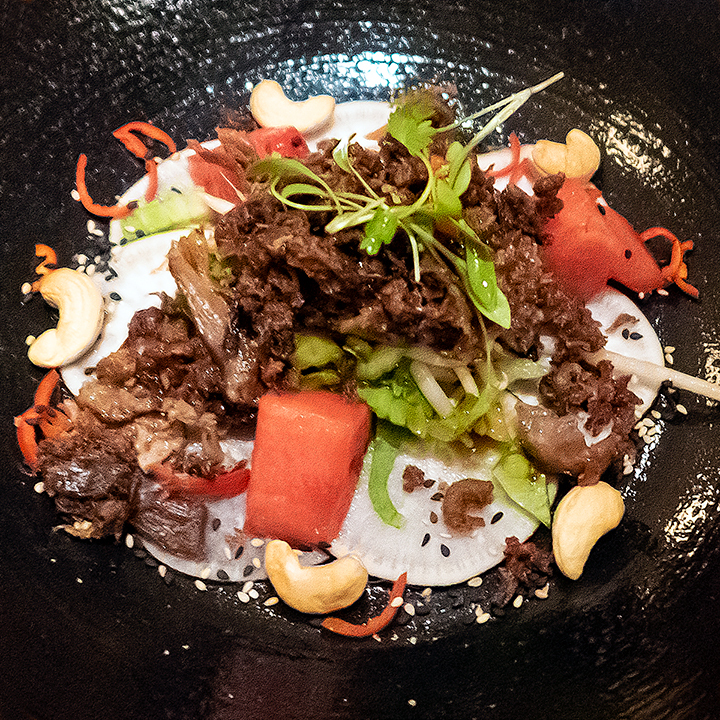 A fine start to the meal, but possibly eclipsed by my companion’s starter, a warm crispy duck salad with five spice dressing, toasted cashew nuts, watermelon, bean sprouts, coriander and ginger. This was a really delicious combination - and it would never have occurred to either of us that duck and watermelon would be such a fantastic match as it was in this dish. This was a great start. I ordered a Kerala-style monkfish and prawn curry, with jasmine rice and coconut ‘yoghurt’ on the side. It was beautifully spiced, and of course the monkfish and the prawns were both cooked to perfection. I particularly loved the coconut ‘yoghurt’ on this side - creamy and utterly delicious. 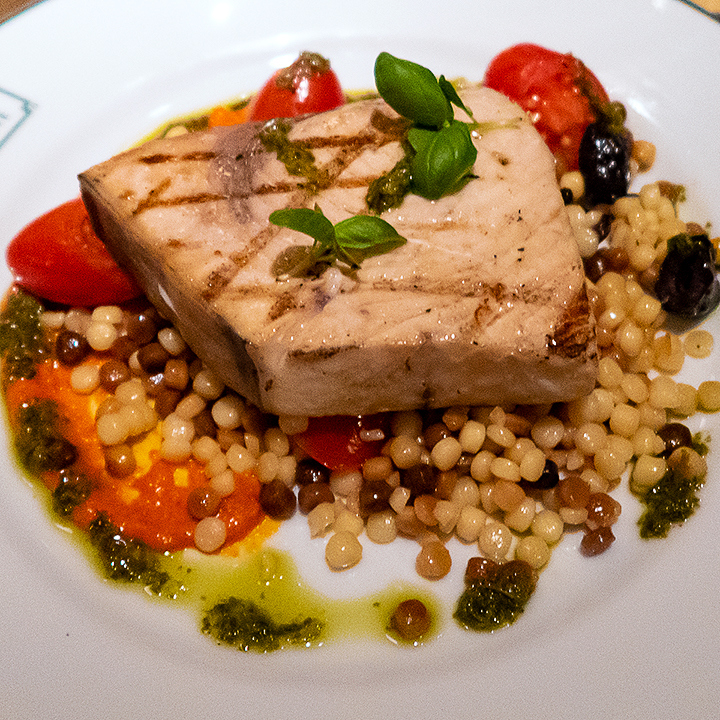 The other main was a swordfish steak from the specials menu, with tomatoes, olives and pesto served on a bed of giant couscous. The fish was cooked well, but my companion thought it didn’t quite match the flavour of the starter - one of the downsides of raising expectations so high with a spectacular first course. I still had space for dessert, and was looking for something that wasn’t one of my standards. So no crème brûlée, and no chocolate bombe (although having seen someone else’s review of that dessert since, I slightly regret not ordering it!). 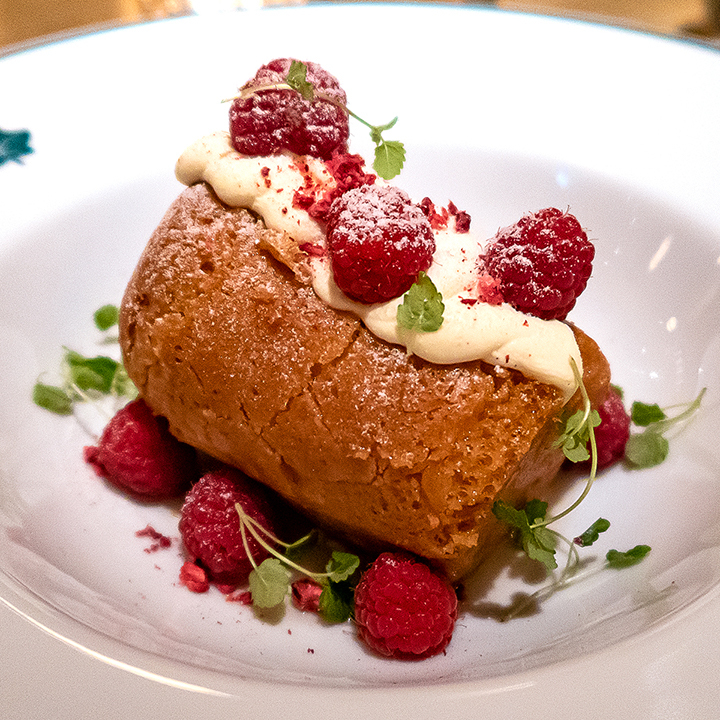 Instead I went for the rum baba, a sponge sumptuously soaked in award-winning Plantation rum, with Chantilly cream and raspberries. More rum was provided on the side, in case it needed it. I thought for approximately three microseconds about that one. It was a fine way to complete the meal. Overall, then, a great addition to the Norwich food scene, and a return visit will certainly be in order. Maybe lunchtime since, in spite of having instagram-friendly lights beaming on every table, as soon as we’d had our starter all the lights were suddenly dimmed to a very low level indeed (which is why some of the photos with the post are a bit grainy - there are limits to what you can do in the dark!). Not a problem for anyone else out to have a good time, but obviously not ideal conditions for food blogging! And it would be good to see the Ivy Collection to add some sort of statement about their approach to sustainability somewhere on their website. That said, Burbridge has spoken about the growing imperative for reducing waste from the kitchen. Not everyone who takes the agenda seriously necessarily makes it a core component of their brand (but that doesn’t preclude giving some information).